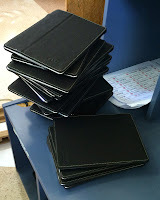 This week we received our iPad shipment from Apple. Enough Minis and Airs for Years 1-3, along with all the appropriate covers. A day to unpack and sort into class groups in preparation for deployment!